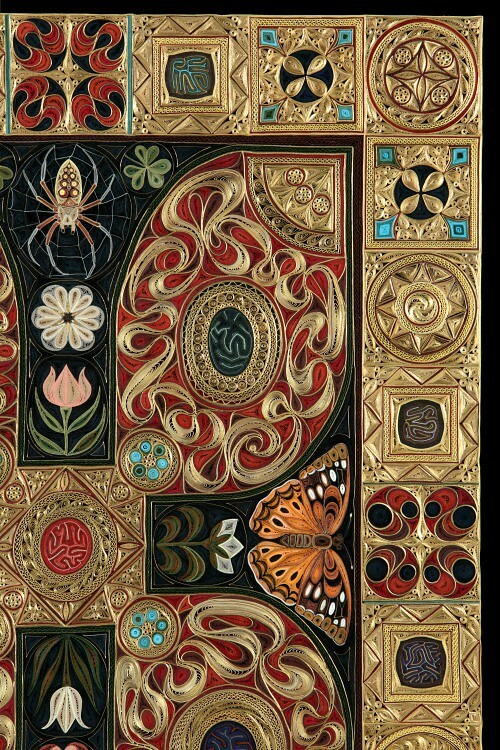 Gospel is artist Lisa Nilsson's fourth remarkable quilled piece in an ongoing medieval-inspired Tapis Series. You might recall the equally dense Jardin that was featured here earlier this spring and previously, Small Red Rug and Binding. Lisa works with 1/4-inch strips that she cuts from large sheets of mulberry paper. As for the gilding that brings such a rich look to her work, she sometimes cuts page edges from discarded books and also uses archival strips that have been edged with gold by a bookbinder. 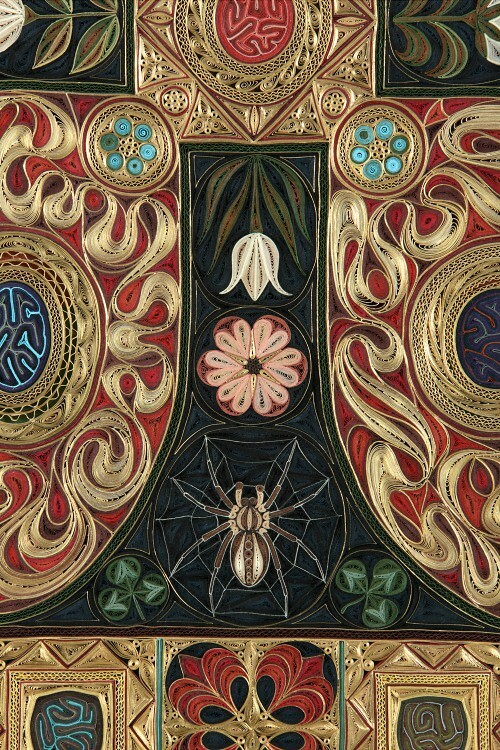 I asked Lisa to share detail shots and to tell us about the work that went into the making of this piece. 18 3/8" x 14 3/8"
Gospel was inspired by the back cover of the Lindau Gospels (8th century) at the Morgan Library in New York City. I was interested in employing the cruciform composition, exploring the possibilities of a predominance of gold, and working with straight lines, right angles and squares in the border. 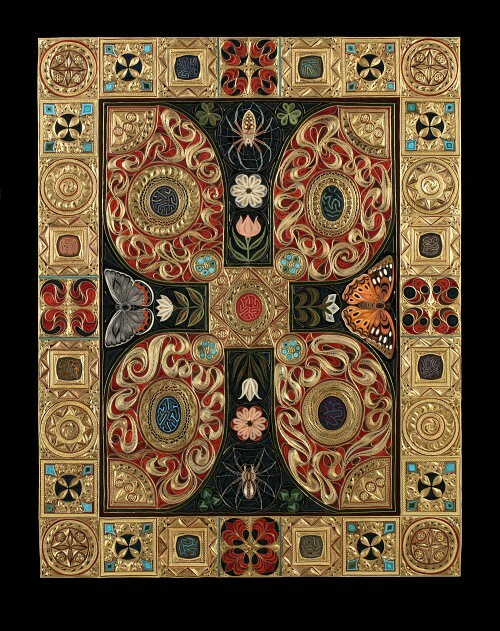 I simulated "jewels" or stones by tightly compressing large loops of paper (see the centers of the red and gold lobes, and the squarish elements in the border) and Byzantine enamel work by surrounding dense, colored areas with thin gold lines (see the red and black areas of the border). I also decided to experiment with representational elements (spiders, butterflies) out of desire and curiosity, and also to replace the Christian subject matter in the Lindau Gospels with natural subjects. The spider webs were especially fun and satisfying. I hadn't planned the webs from the outset, yet when it came time to make the shapes that would fill the negative spaces around the spiders, the web possibility became obvious. The edge of a single piece of the tissue-like mulberry paper I use was just right to suggest a web. 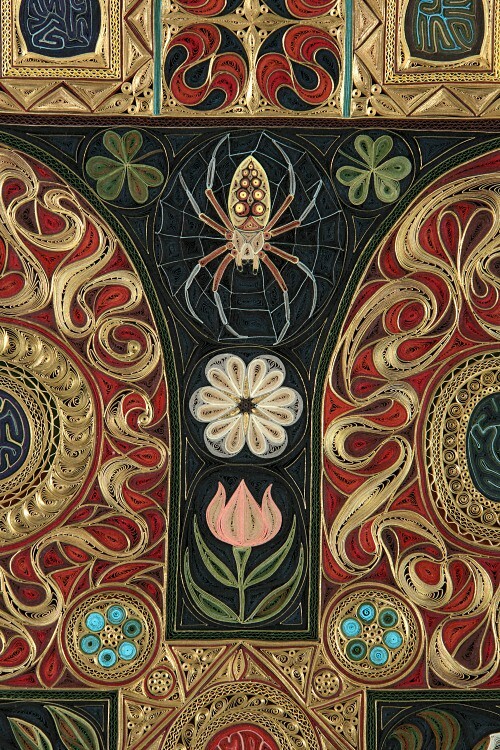 Pavel Zoubok, gallerist and muse, is fond of spiders; I was thinking of him. I love reading about the conditions and limitations of the makers of the objects that inspire me. The limitations that life imposes-- limitations of time, energy, space, materials and attention-- all contribute to what the objects are. How intricate and detailed. Thank you for showcasing the artist. Amazing work. 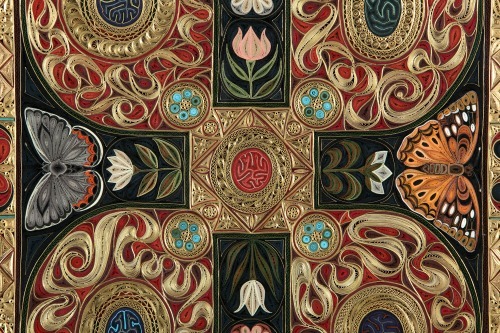 Best quilling I've ever come across so far. Wow! Her work is incredible! So beautiful. Zeljko, I'm glad you admire Lisa's work. Thank you for taking the time to comment. Oh, man, Ann! You continue to find the most astounding paper art to show us! I'm inspired for the summer now! That's good to hear, Karren! Looking forward to seeing your new creations.